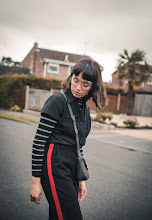 A casual look gracing the blog today, taken from last Saturday whilst I was out exploring the city and doing a spot of shopping. As the day was fairly relaxed I decided to pair my (much-loved) flared trousers with this lilac lace insert top (from ark) and my metallic jacket, which I practically have been living in as of late. We decided to take the photos just outside St James park-pre-marathon! I have to admit it was exciting to see all the prep they were doing for the day, and seeing them put the final touches in place. Also I have just done an interview with the lovely people over at Ark, discussing everything from blogging, things that inspire me, to my favourite ever music video. Be sure to check it out here!